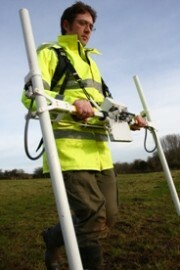 A training session with our Bartington Magnetometer is planned. Well meet in the ARF room 110 and bring the instrument over to the nearby grassy quad at Wurster hall where we'll practice data gathering. 3 - 4 pm, Download data and preliminary analysis steps. The data gathered in the Wurster quad will be too electromagnetically noisy for real analysis but we can simulate the process and then for the final analysis step at the computer we will use real data from another location.